Since all of the functions of BoatShowManager are fully integrated, you sales process is seamlessly tied to CRM. From the customer's Business Development Page, it is only a single click of a button to forecast a sale or check the entire status of an existing sale or sales forecast. At any time updating the sales record to change probability, add or remove sales items, or complete, is only a few clicks away. Boat Show Manager includes a number of important sales reports. One of the most useful is "Forecast plus Completed". This report shows all completed and forecast sales with a total sales value shown for both "Total Sales Value" (projected revenue if all forecast sales close) as well as "Current Forecast Value" (projected revenue based on now current forecast probability). You always know where you sit relative to target sales goals. 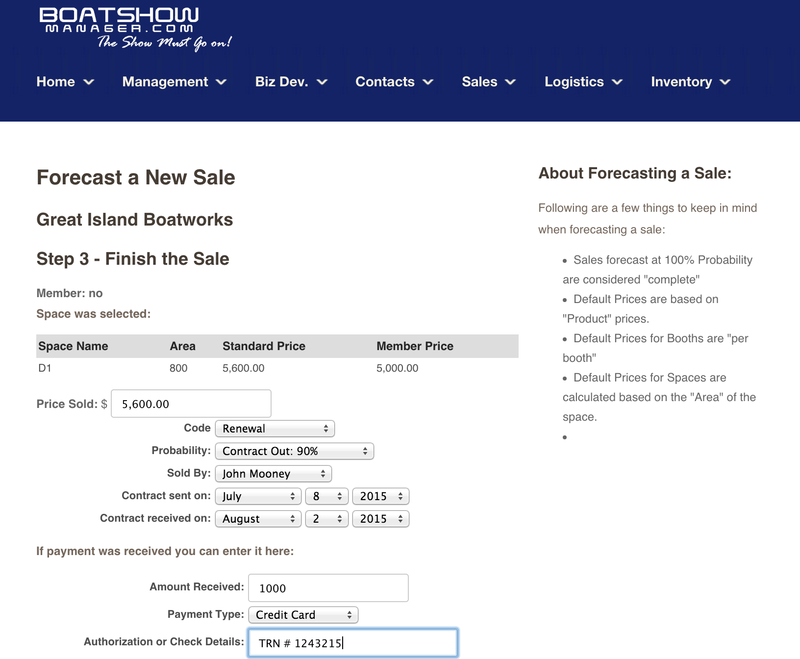 Since historical sales data is maintained by BoatShowManager, you can see "Last Year's Sales" from a either the "Forecast plus Completed" sales report or the "Last Year's Sales" report. In order to forecast a previous year's exhibitor as a current year sale, you simply click "Roll this Sale".